The message boards are threaded, which means that unlike TORC and lots of other boards, the messages are arranged similar to an outline. 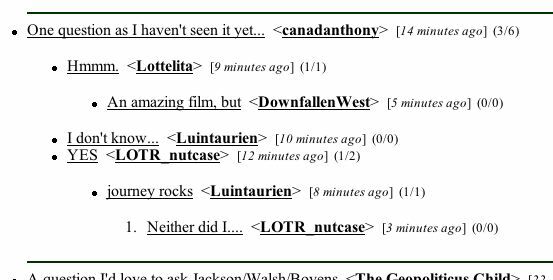 So, above, canadanthony has made a post, and Lottelita, Luintaurien, and LOTR_nutcase have made replies ("hmmm." "I don't know..." and "YES" respectively). And then you can see that DownfallenWest has replied to Lottelita ("An amazing film, but"). "journey rocks" is then the reply to "YES" and... do you get the idea? Also, you can see that after canadanthony's post, at the very end, there is (3/6). This means that there are 3 posts in direct response to his, and 6 posts in the thread not counting his. So, (x/y) after the timestamp means x posts in direct reply and y replies in all (not counting the original). Not really vital, but interesting to know what that means. canadanthony's post is called a "topic post" since it begins a new thread, or series of posts. It is VERY IMPORTANT to note that each new topic pushes an old one off the board, and once a post has dropped off the board, it is inactive and gone forever. This is why topics like "Legolas is hotttt!" and "Who's on right now?" are not appreciated. On that note: it is impossible to predict how long any given topic will stay on the boards. It is also impossible to know whether or not the server load will permit you to scroll "back in time" (the drop-down menu is always there at the top of the screen, but sometimes traffic is such that it doesn't work). Because of this, you may become frustrated, trying to find out whether anyone replied or answered your question or whatever. Really, there are only two things you can do about this situation. Your best bet is to bookmark a post if you think you will want it later. If you don't do that, you can always look in your History folder and cross your fingers that some part of that thread is still there. So. Let's move on to posting. Thanks to Arwen_nz for helping with this page!